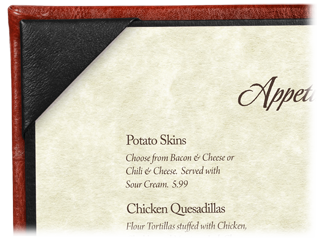 Faux cowhide menu covers provide a soft and inviting appearance with a touch of class. These menu covers are incredibly soft to the touch and the unique texture is unmatched. Unlike genuine cowhide or other high end natural materials, faux cowhide menu covers offer all the style with none of the maintenance or costliness. Although they look and feel like perfectly tanned cowhide, our faux cowhide menu covers are actually composed of a thick polyurethane material, which is carefully bonded to a foam padded (or unpadded) board and a leatherette lining. The inside lining and corners are made from imitation leather in a complementary color. 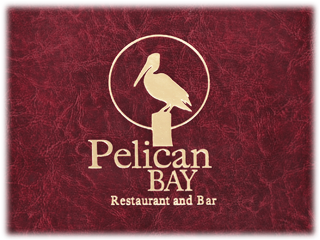 Every feature of your faux cowhide menu covers will be fully customized to perfectly match your restaurant's style needs. This includes a complete array of trim options, including custom edges and foil stamps of your restaurant's logo and name. You may also chose to feature your logo inside a cutout, picture frame window. 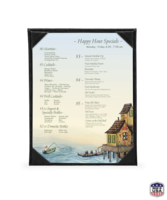 Menu covers include sturdy, flexible tabs, which will reliably hold a menu sheet in place, but allow for easy removal at your discretion. Menu corners can be square or rounded to suit your preference. The faux cowhide menu cover is an outstanding solution for any restaurant that needs menus that will add a charmingly high-end feel. Faux cowhide covers are a top choice for rustic-chic restaurants with the naturally supple texture and appearance of cowhide, without the maintenance and cost typically associated with leather. 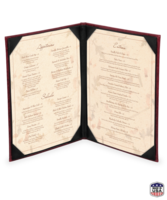 A typical faux cowhide menu cover will last for at least five years, making it an outstanding long-term investment for your restaurant. The thick and durable polyurethane material is resistant to stains and everyday wear and tear. Although they have the soft texture of cowhide leather, a faux cowhide menu cover is extremely rugged and stain-resistant. This makes cleaning a snap. All you need to do is wipe them off with a damp cloth and a little bit of soap. Also be sure to thoroughly dry the covers when cleaning is complete. 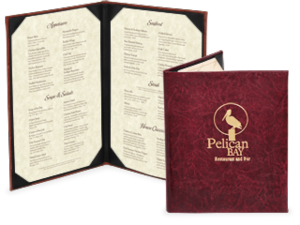 We ensure that your menus can fit into your new faux cowhide menu covers, no matter how large or small they are. 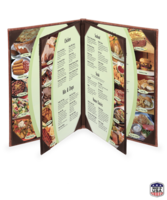 We provide you with seven stock options for menu cover size. You may also choose from a variety of booklet-style designs including: single, double, four-view, and six-view. 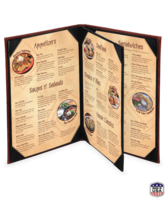 In order to ensure that your menu cover perfectly matches your restaurant's decor, we provide a wide selection of colors for your to choose from. The menu cover's color can be customized for both the exterior backing and the inside lining. Midrange. Faux cowhide menu covers provide you with a high-end accessory quality at a midrange price. This allows you to get the most possible value out of your investment. The soft, natural appearance and touch of cowhide instantly gives your restaurant a uniquely elegant appearance. This high-end feel can be added to your restaurant's style without paying a high-end price thanks to faux cowhide menu covers. With the same soft look and feel of genuine leather, this faux cowhide menu cover offers the same classy look with a lower price than genuine leather.